“What do we have to eat that’s sweet?” asked ‘Mr. Meat and Potatoes’ Bill. He was speechless! Sweets and football games on TV will quiet this man faster than anything I know. Off to the kitchen I scurry. This cake took one half of the day to make. Bill got his cake and ate it too . 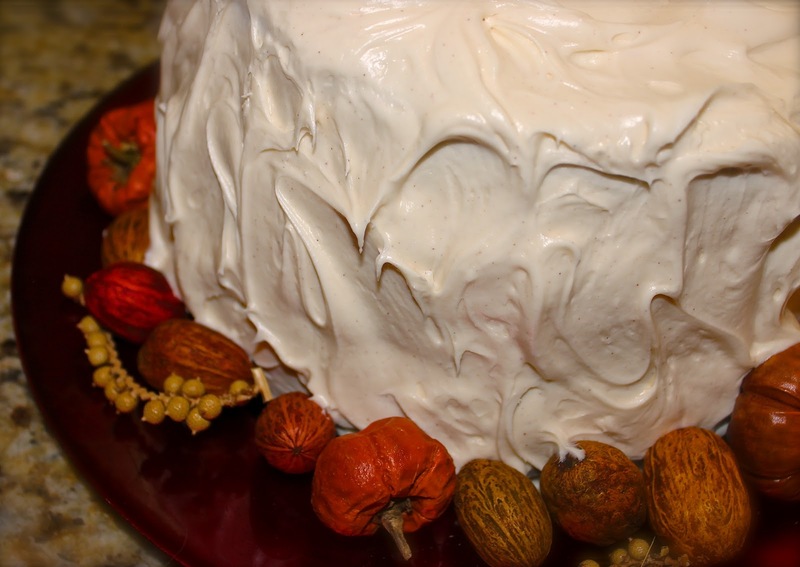 . . the next day with this Carrot Cake with Praline Filling & Cream Cheese Frosting! If I wanted to sell this cake I’d have to charge $10.00 a slice just to break even with the ingredients and time that was put into baking it. Oh, but made with so much love! Let me warn you, the praline filling alone will send you directly to blissful heaven. You may even find yourself spooning it . . . no pouring it into your mouth as it cools on the stove. 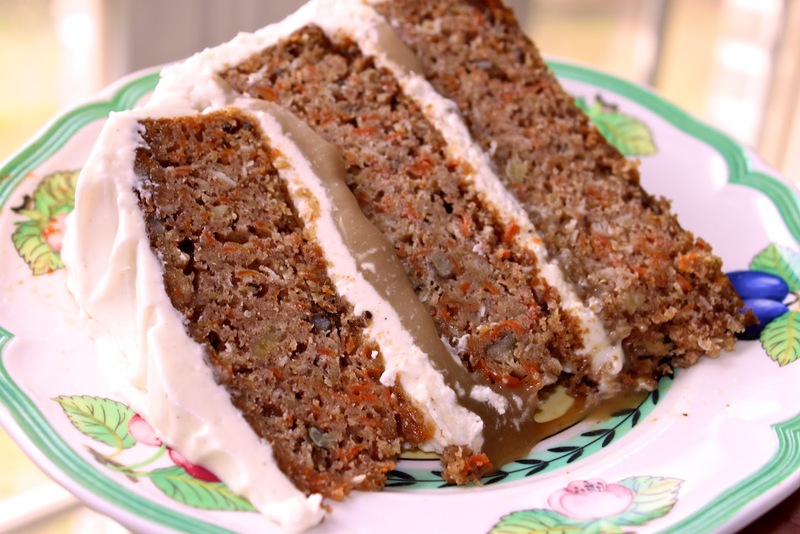 This is dangerously rich stuff that puts a humble carrot cake way over the TOP! I think I’ll make a bigger batch of it the next time to drizzle over the cake! I doubled the frosting to make this extra luscious. For me, it’s the frosting on the cake that matters more than the cake anyway! But I rarely eat sweets, being more of a savory flavor kind of gal. Maybe that’s why my husband begs me to bake . . . I really do need to do this more often. Baking really is quite fun! thick layers of frosting on my cakes, that’s why the recipe calls for such large amounts of ingredients. In this open portion of the cake the praline filling is dripping down the cut cake . . . oh so good! Prepare praline filling and cream cheese frosting. Prepare 3 9-inch round baking pans with butter/cooking spray and flour dusting. In a small amount (about 1 cup) of water, cook the shredded carrots for about 15 minutes to tenderize. Drain all of the water from the carrots. In a large mixing bowl, add the flour, sugar, brown sugar, baking powder, baking soda, salt, cinnamon, ginger, cloves and nutmeg. Add the softened butter, oil, eggs, vanilla extract, pineapple, coconut, pecans, and carrots. Bake for 35 – 40 minutes or until an inserted toothpick comes out clean. Place on baking racks to cool. In a heavy pan, melt the butter. Add cream, vanilla, and salt. Slowly add in the flour and cornstarch. Vigorously blend well with a whipping utensil. Use a small-holed strainer to remove any lumps of flour/cornstarch. Pour the praline filling into a metal bowl. Place in the freezer for a few hours to thicken or refrigerate overnight. Gently remove cooled 3 cakes layers from pans. 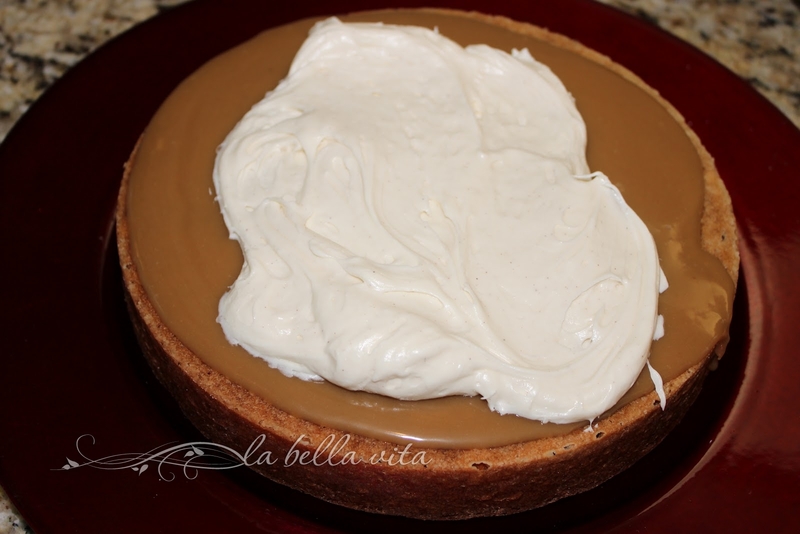 Pour half of the praline filling onto 2 of the cake layers only. Immediately place these in the freezer if the filling is too runny. This will thicken up the filling more quickly. Remove chilled cake layers with praline filling from the freezer after several hours. 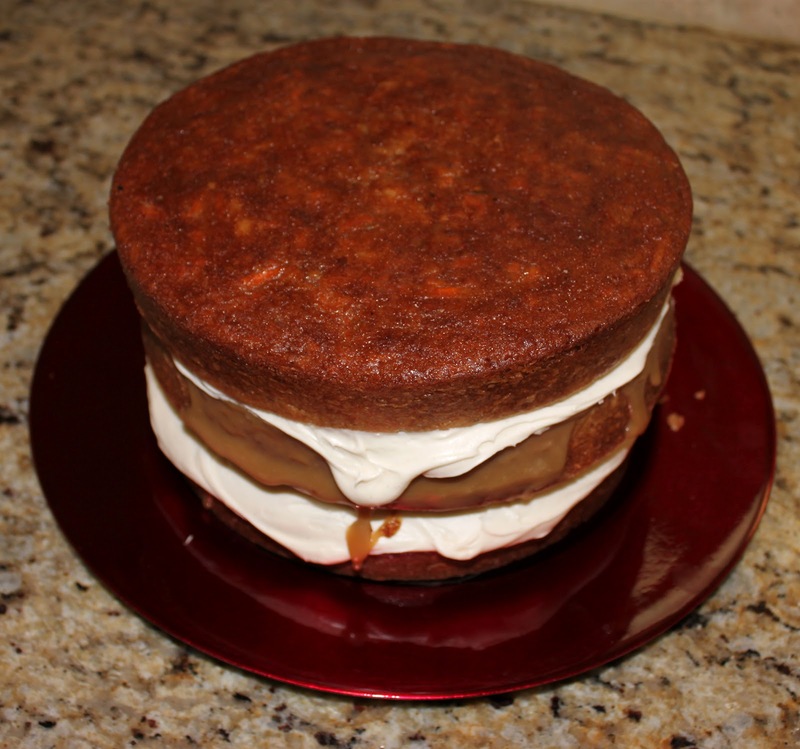 Spread thick layers of cream cheese frosting on top of the two cake layers with filling. Place these two cake layers on top of each other and then place the final third cake layer without any praline filling on the top. Frost the cake and decorate how you like. pour the praline filling over two of the baked cake layers . 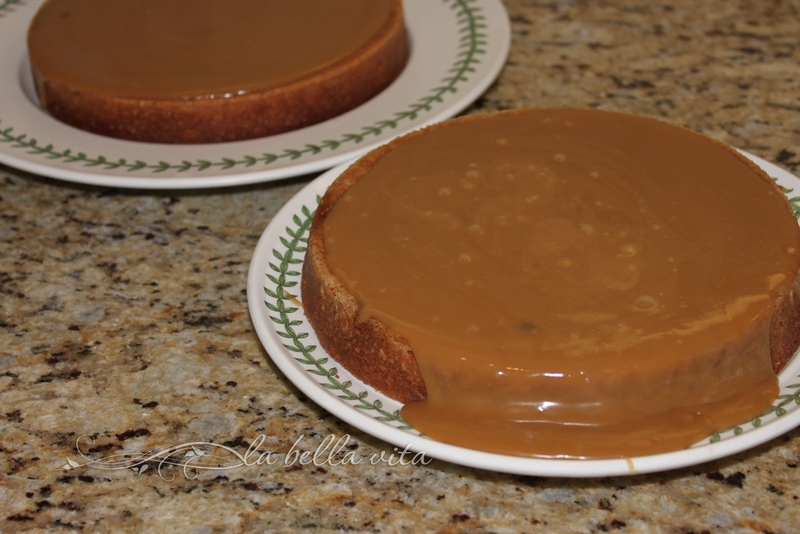 . .
.place the second praline-topped cake layer on next and frost it too. 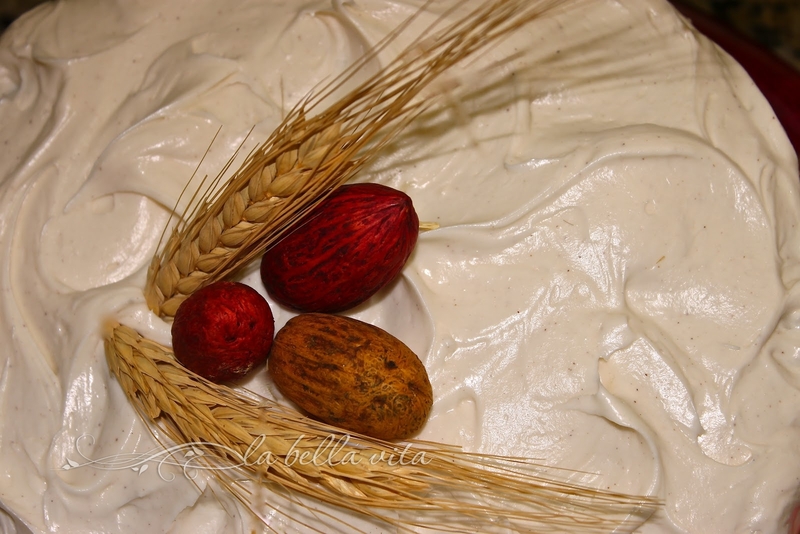 .decorate your cakes with simple things from the craft stores such as these wheat and nuts accents. My good friend, Liz gave me the honor of baking this cake for her book club and posted it on her blog, That Skinny Chick Can Bake and it was a huge hit among the group and her family! My sister, Kelly, made it for her husband’s birthday and recommended it to Liz. I know that you’ll get the same reactions from others when you present this delicious Carrot Cake with Praline Filling & Cream Cheese Frosting! omg are you kidding me.. how can you photograph this and not send everyone a piece … my mouth is watering and really mad I cant have this right this minute! Claudia, I wish I could share this with your husband and you because it is FAR too big of a cake for just my husband (I only eat about a fourth of a normal slice)! Jenn, thank you so much . . . it really is a good recipe that I hope you can make and enjoy some day. It feeds a LOT of people! Oh my, I don’t think I will fit into my jeans just looking at the photo. Then again just one slice would be OK since I can never resist carrot cake! That’s exactly why I’m not eating a lot of this cake . . . my super-skinny-can-eat-anything-and-makes-me-sick husband will eat the entire damn thing, Val! As my daughter would say, “Oh Mon Dieu.” And pass the cake. I love how you used this as a transition to autumn. I make a carrot cake for husband for his August birthday. Thought it was pretty good until I saw this. As my mother would have said, “I’ll have a credit card slice.” Your husband and my husband would get along very well. I am wishing you all good things for your year off and recovery. Hope Italy speeds the process beautifully! A credit card slice is perfect for this for people like me who gain weight looking at food! Maybe even just a bit too! Thank you for your well wishes for my back health. . . it’s been slow recovering and I’m glad that I have a back brace for walking around Italy. The wine will help too! Especially helpful will be some strong limoncello! I’ll leave an address and you can mail me a piece. Okay? Will do Patrice! I’ve got plenty since this cake is HUGE! That’s too funny, Jo! I read your comment to my husband and he got a good chuckle too! Oh wow – this is wicked – and I do love wicked, so cut me an extra large slice. Perfectly described LInda . . . I’d cut you as big a piece as you’d like! Oh, what an awesome cake! Divine flavors. I wish I could taste it now…. Thank you Rosa. I wish you could come on over and shoot some photos with your new camera. You amaze me with your camera talent! I read the recipe, looked at the pictures, and gained 2 pounds. A wonderful to hear . . . another frosting lover! That’s the place in a cake where I’m just GONE! Wow – you have one lucky husband! That cake sounds and looks wonderful. I can’t imagine how delicious it must be. 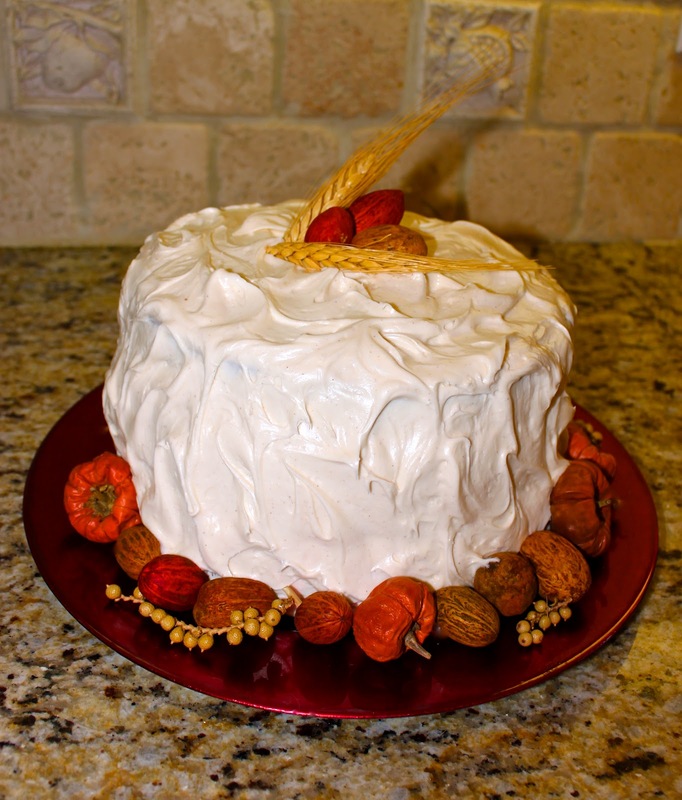 Your fall decorations are (also) icing on the cake! I agree with Tricia, he’s pretty lucky and I just wish I could eat this and any other cake like he does without gaining a pound! Thanks for the kind compliment! Hi Laura! Welcome! I just found your blog too! Thanks for your visit and sweet comment! I hope we visit each other more often! 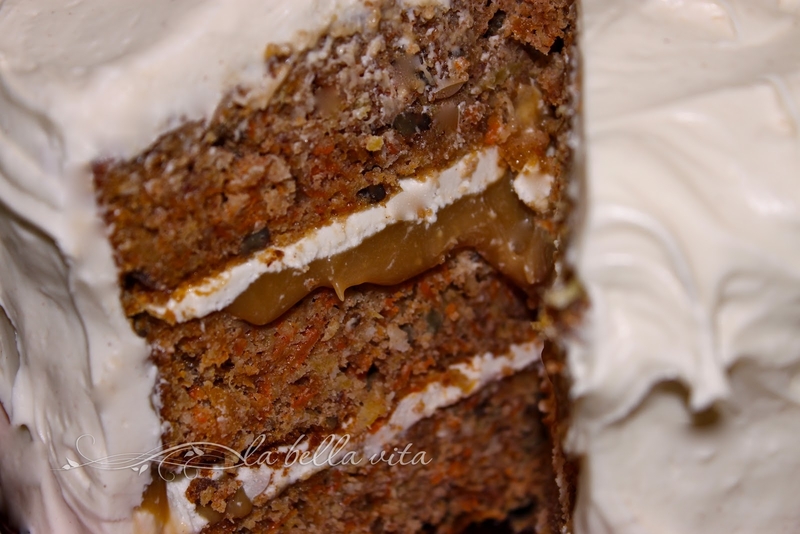 Carrot cake, praline filing and cream cheese frosting?! Be still my heart! Hi Jackie! What a compliment coming from such an experienced and accomplished baker such as you! Thank you so much! I can see why you like carrot cake for your birthday! One of the best cakes there is! Carrot cake one of my favourite! The name sounds so healthy, almost boring, but this MASTERPIECE is rich and full of sweetness!! The investment in time and ingredients to bake this cake is well worth it. Well done! I know what you’re saying Rita . . . sounds healthy, but really oh so decadent! Every now and then we can have a little splurge, huh? Thank you for your visit and compliment! wow Roz, this is luscious and HEAVENLY! Shared! Thank you Angie, I’d enjoy any of your recipes for an entree before a bite of this cake. Thank you for the tip about placing a ‘pin it’ button on my blog. So kind of you! Don’t see a pin button? Can I just copy your photo url to Pinboard? Thanks Angie! The pin button is in the “+” symbol below. Type in Pinterest and it pops up. I’d like to add the ‘pin it’ button to my posts and need to do that right away, huh? yes, go ahead and copy the photo and url on your pin board. Thank you for doing that ! Thank you so much Piping Bags! I went to your site to leave a comment, but couldn’t find where to do so. I agree, sometimes good things should never be changed, but I knew that I wanted a different filling this time and it really worked nicely. I hope that you stop by and visit again! 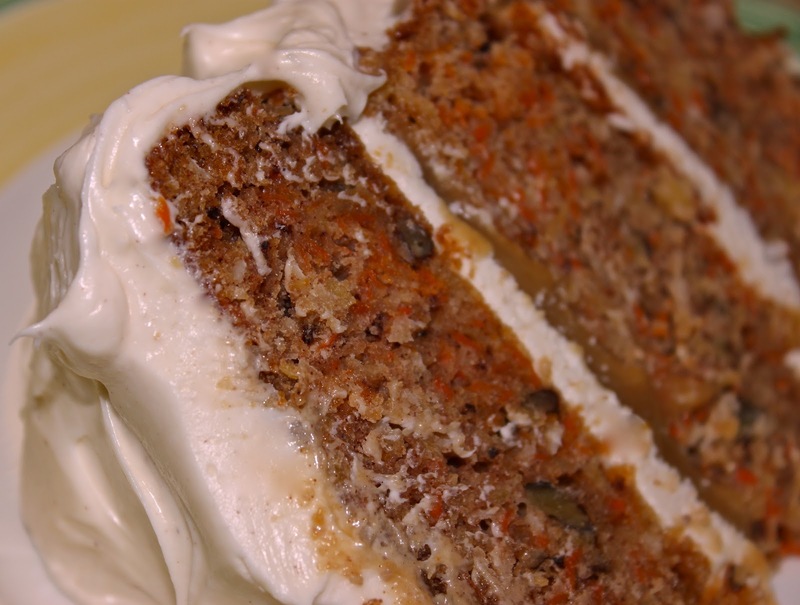 Beautiful job Roz – I haven’t had carrot cake in years. Thank you Larry! 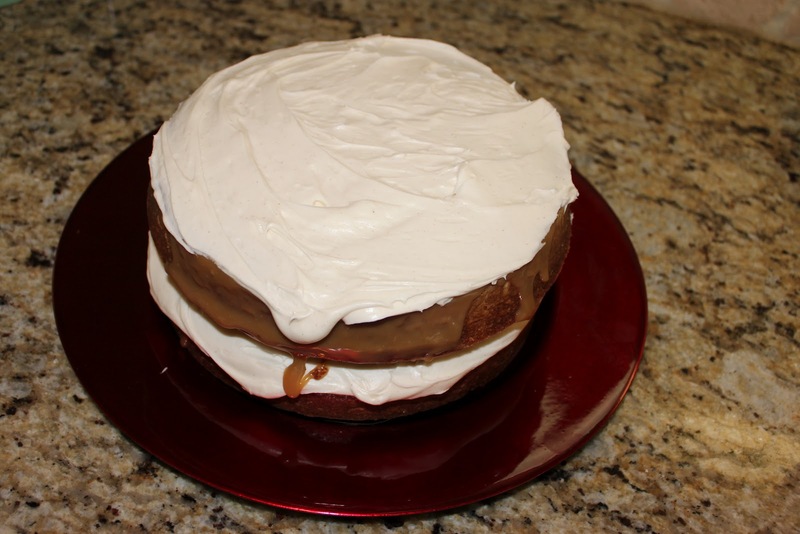 Bill and I have been wanting to try and duplicate a cake prepared by a local restaurant that doesn’t share recipes (and I understand that), and we think that this recipe is even better than theirs! It’s mighty fine and mighty fattening! I so love carrot cake! I bet I would finish the entire slice, no matter how rich. The praline filling sounds amazing. Your husband must have been thrilled! Thanks Lisa . . . it is terribly hard to resist even one little bite of this cake. My husband is in cake heaven! Thank you Marina! And I hope that you can enjoy a good carrot cake someday! Actually I can believe that because Switzerland is so international and so many wonderful cakes and pastries are made there. Talk to you when I return from Italy! Great effort and wonderful result, good job! thank you Vittoria. I arrive in Italy tomorrow and cannot wait to see your wonderful country! Liz . . . You did a SUPERB job in baking this cake and the presentation with the nuts on the side makes it all the more beautiful and inviting to dig straight in! Gave you a link back too! Mercy, that frosting looks so billowy– I could do a face plant in it! When we love our man that much, spending hours in the kitchen baking up something you know they will love is totally worth it! That praline filling looks divine! 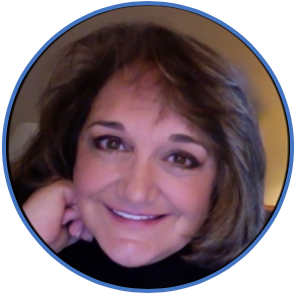 Great job ,Roz! Thanks for your sweet comment, Debby! I am always inspired by your baking recipes and your amazing results! I need to bake more often; it sure is fun!